Olson and her team's approach to determining the relationship between stiffness and interior mapping involves a combination of finite element methods — a numerical method for solving problems in engineering and mathematical physics — and genetic algorithms — a method for solving optimization problems based on natural selection. Researchers from Lamar University, including Tao Wei, Ian Lian and Yu-Hwa Lo, are exploring a different approach to nanoscale cancer diagnostics. In place of nanopores, they are using lab-on-a-chip techniques invented by Lo's group that can recognize short nucleic acid fragments — which act as biomarkers for diseases — in the bloodstream. In a series of publications in the Journal of the American Chemical Society (2014) and Nucleus (2014) enabled by Stampede, Herce and his collaborators described the creation of a novel peptide – a chain of several amino acids — that can enter the cells of an organism, separate from its carrier molecule and bind to PCNA. They also uncovered the nature of the interactions between the peptides and their PCNA targets in atomistic detail. Finally, they showed that both replication and repair sites can be directly labeled in live cells — the first cell-permeable peptide marker for these two fundamental processes — and introduced a PCNA staining method that causes the target molecule to light up so they can assess its distribution. From better palpation systems, to nanodevices that enter the bloodstream — or even the nucleus of cells — and uncover signs of cancer, new diagnostic systems are coming and supercomputers are helping researchers design them. This feature is part of a TACC Special Report on Cancer. From patient-specific treatments to immunology to drug discovery, advanced computing accelerates basic and applied science. 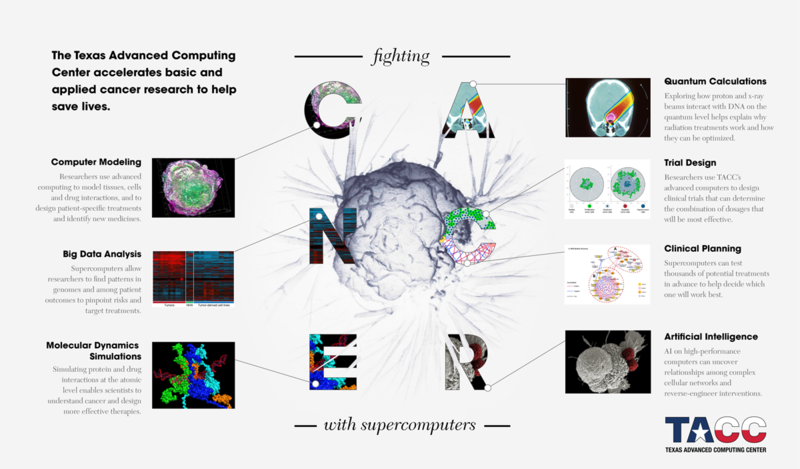 Learn more about how supercomputers are being used in the fight against cancer. Using TACC resources, researchers explored new breast tissue mapping systems, nanopore and lab-on-a-chip biosensors, and cell-entering cancer detectors. Advanced computing is critical for the simulation and materials design aspects of these emerging diagnostic devices.